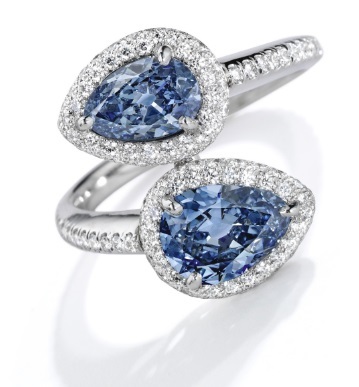 Sotheby’s has set out to prove this year that they are the auction house with the premier selection of diamonds and jewelry. Beginning with their decision to finally resell the Pink Star, they have also procured some excellent fancy color diamonds to sell to their expectant clientele, far exceeding the selection of their main competition, Christie’s. Christie’s has managed to accumulate some high-level goods for their auction in Geneva in May, but until then we have been left somewhat disappointed with their assortment of investment quality diamonds. 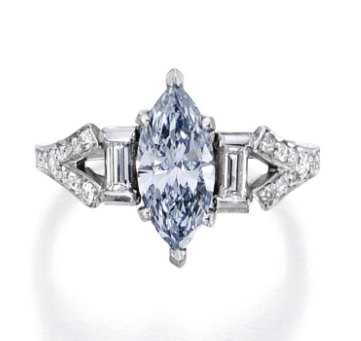 The overall impression left by this auction in NY was that fancy color diamonds maintain strong prices, and in some cases even exceeded the expectations of the auction house. The top lot for fancy color diamonds was the 11.19 carat Fancy Pink pear shaped diamond, which came back to auction after it failed to sell previously. It was estimated to sell at a price between $1 million to $2 million, and ended up selling for $2,412,500 or $215.6k per carat, 20% above the high estimate. That is pretty good for a diamond that was making a reappearance. The following item was the rare 1.64 carat Fancy Vivid Green cut cornered square mixed cut diamond. 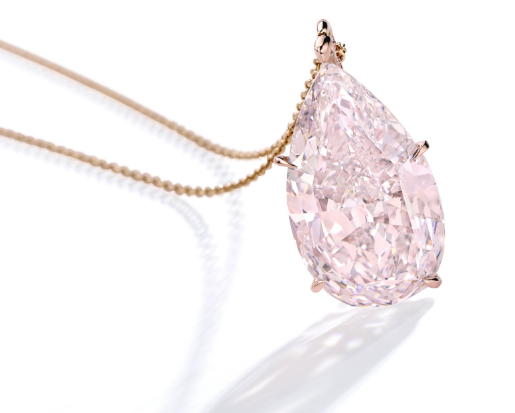 It was estimated to sell between $1 million and $1.5 million, but ended up selling for $1,212,500 or $739k per carat, the mid-range of the estimate. Green diamonds are always the most difficult to assess in terms of value due to their rarity and lack of appearance in auctions. This color is most suitable to a collector’s market. 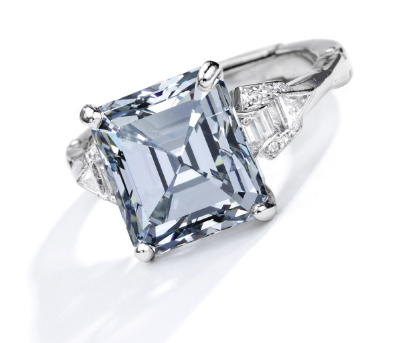 The double Fancy Vivid Blue diamond ring with the 0.96 carat and 0.64 carat diamonds was estimated to be sold between $700k and $ 1 million, but ended selling for only $876,500. In this case, because both diamonds were under a carat, the average price was just under $548k per carat. That makes the final sale amount a good value price. 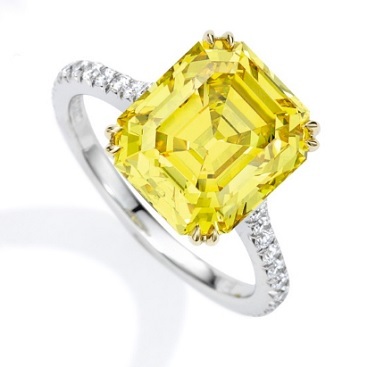 The surprise of the fancy color diamond items was the 6.17 carat Fancy Deep Yellow diamond ring. 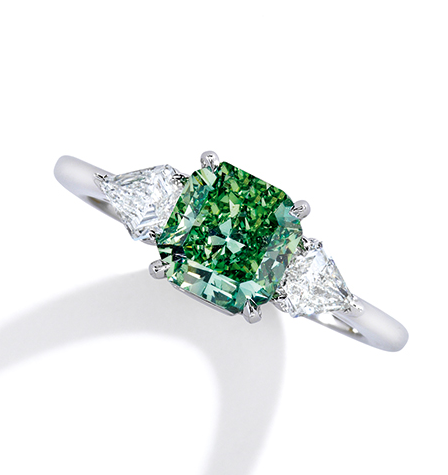 Estimated to be sold for between $150k to $200k, it ended up selling for $750,500 or $121k per carat. That is a very strong price for this diamond. The color was strong, commanding almost four times the high estimate for it. Although the 1.14 carat Fancy Intense Blue diamond did not break a record, it ended up selling for $492,500 or $432k per carat, a 64% premium to the high estimate. This was an excellent price for such a diamond, typical behavior for diamonds of Fancy Intense Blue color. Considering that in most of the more recent auctions, the diamonds did not exceed their estimates by the auction house, we have been wondering about the demand intensity by the market. In some periods, the goods are estimated exactly to their sales price, and in other cases, the auction house underestimates their diamonds’ respective demand. The behavior in just April of these diamonds indicates a positive growth projection for the year ahead. In May, it remains to be seen if prices will exceed their expectations or will be on the mark. Follow us on Twitter as we report live from the exciting auctions in Geneva. Got any questions? Ask in the comments! Geneva Auctions In May Are Like The Black Card – No Limits!